French free-to-air digital satellite TV platform Fransat has unveiled the latest version of its interactive portal Fransat Connect which now integrates MYTF1VOD, the VoD service from French broadcaster TF1. Fransat Connect gives viewers access a wide range of interactive services, by simply connecting the TV equipment (STB or Fransat-badged TV set), Internet, including homes with limited connection speed. MYTF1VOD says that becoming part of the Fransat Connect portal confirms its ambition to deploy an innovative and attractive offering on all connected networks throughout France. 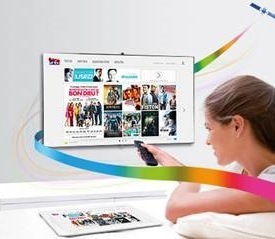 MYTF1VOD becoming part of the Fransat Connect portal joins together one of the leading video on demand players and a pioneer of HbbTV, with TF1 the the first French broadcaster to launch such a service. MYTF1VOD is available on Philips and Sony Fransat-badged Smart TVs. The range of compatible TVs and set-top boxes will expand to other models and other brands in the coming months.